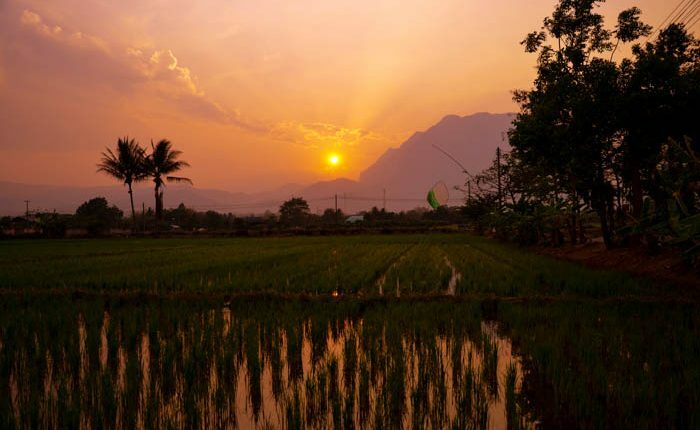 Pai is the place to go – well, at least the travel guides say so and the crowds of tourists that go there seem to think so, too. But you know what? I’ve been there and it’s no good. First of all it is overcrowded and it seems like the town is struggling to cope with the amount of people that go there. It took me an hour to find a place to sleep. The accommodation and food seem to be quite overpriced. My sister also noticed one thing about the place – it looks like an artificial town, like someone built it only a few years back for tourists only. It is hard to spot a local here among the sea of white faces. I’ve been there twice, sneering at it every time and, during my last stay, I decided it was time to explore other places in the north. 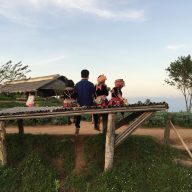 So, I went to Chiang Dao and Mae Hong Son, spending a few nice days at each of the places. 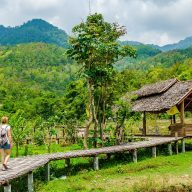 The small town of Chiang Dao is only 1 hour drive by scooter, or 90 min bus ride from Chiang Mai. The road is straight forward and there’s almost no possibility of getting lost, if you have your own transport. 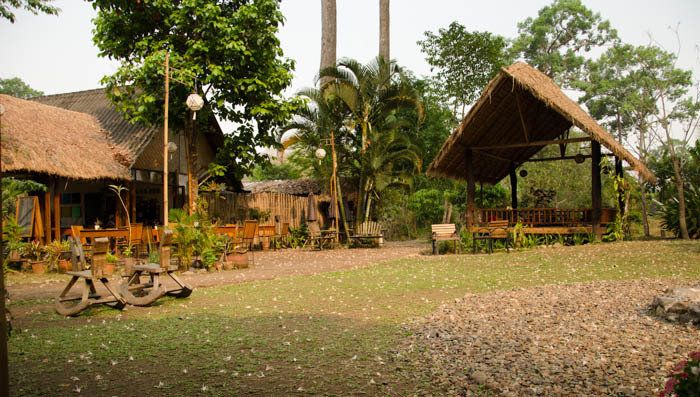 The amount of places to stay is sufficient and you shouldn’t have any trouble with finding a decent hostel. Most of the better guesthouses are located near the Chiang Dao Cave, but you can find some cheaper places, too. I stayed at the Cee and Chan’s Bungalows for 400 Baht a night per bungalow. The bungalows were clean and brand new. They have a nice outside area to chill out. I read somewhere that the owners are Thais and don’t speak English. Surprisingly, the owner was a farang and spoke perfect English. Thanks to its location (outside of town, at the back of the main road) it is a very peaceful and quiet place. 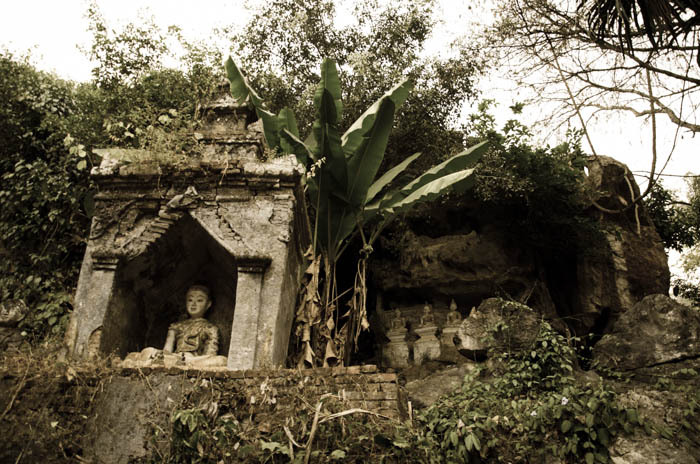 Chiang Dao and the surrounding area offer a lot of things to do from caves to tribal villages. Some of the places in town offer trekkings and trips, but the best thing to do is to rent your own scooter and drive around. You can rent one on a main street, in a small rental place, located just next to Tesco Lotus. The cost is around 150 Baht per day. Once you have your own transport you can explore the area. Turn into Soi 15 and follow the road, past the bridge. 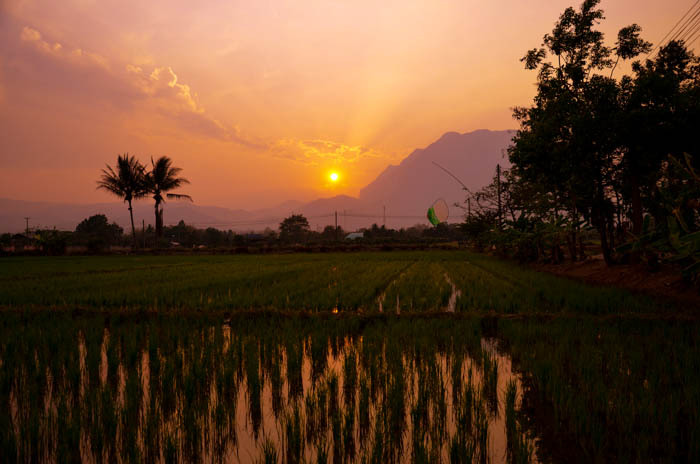 The rice fields on the way are beautiful during the day, but even more so during the sunset. If you follow the road further, past the rice fields, you will get to a T junction. Turn right until you get to a left turn. 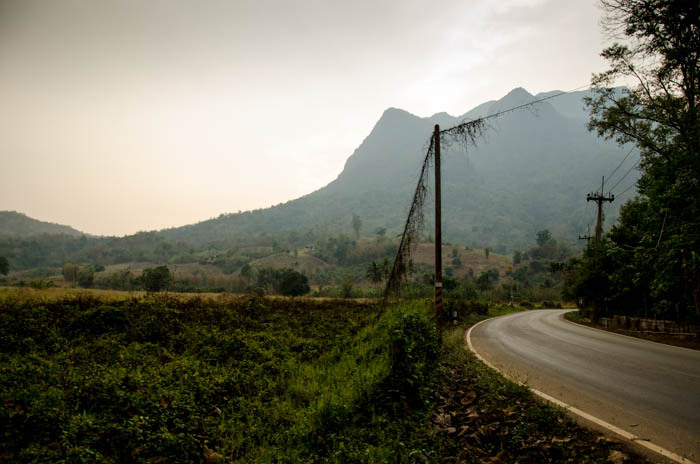 This road leads to some tribal villages, but also to some really remote places that are yet unexplored by tourists. There is nothing better than riding your bike through empty roads with magnificent views. I spent two days exploring the area. 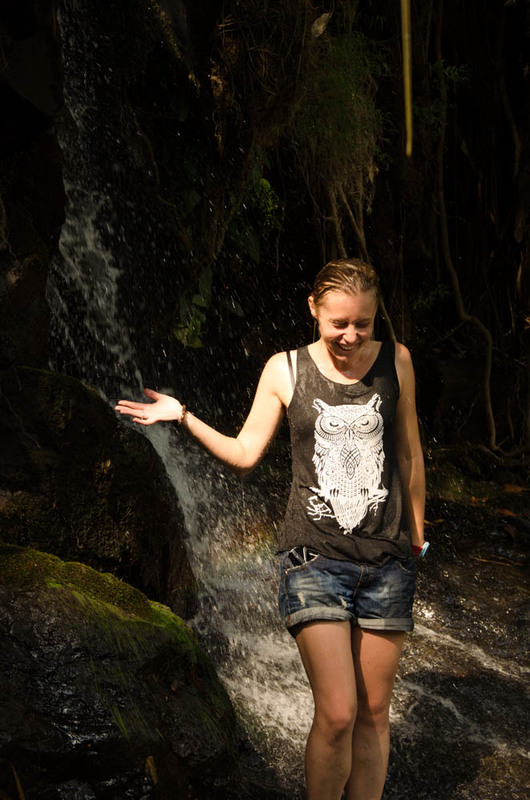 Once you have done this, go in the opposite direction, towards the Chiang Dao Cave. 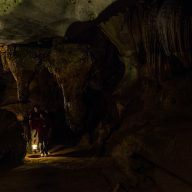 The cave is one of the main attractions in the area. 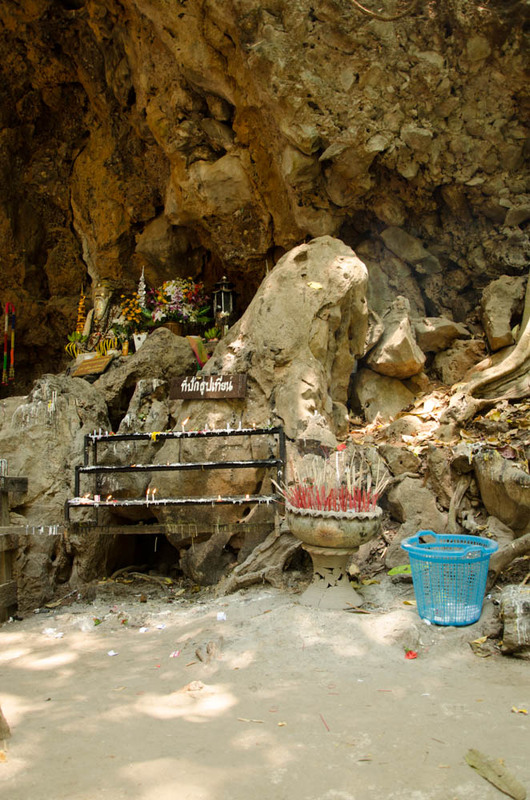 The outside of the cave is surrounded by little shops, and old temple ruins, which are really worth exploring. Just mind the stray dogs, which seem to be not that friendly as in other places. The cave itself is huge and, thanks to small amount of tourists, you have an impression that you are the first one to discover the place. The only thing that spoils the visit is the price. This information you will find almost on all travel sites. First you need to pay 20 Baht entrance fee, then you will be informed that you can’t visit the cave by yourself and need to take a guide, who will charge you 100 Baht for the torch (bear in mind that the cave is huge and there is no way you can walk there by yourself, so don’t argue with the people working there). At the end of the tour the guide will inform you that he/she is a volunteer and you need to ‘donate’ 100 Baht for the tour. You don’t really have a choice… However, despite this ‘scam’ the cave is really worth seeing. Near the cave you can stop in many of the nice cafes and restaurants for a meal or drink. This area is beautiful and very quiet. At the time when I was there is was overflown with yellow and white butterflies. 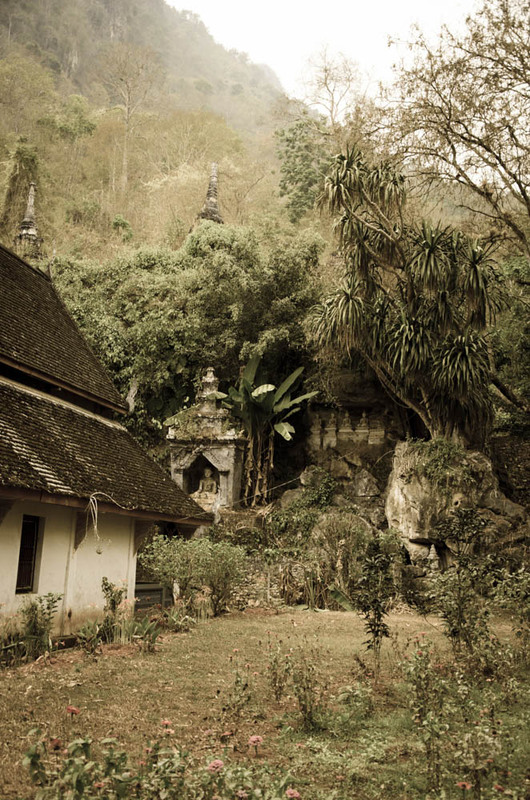 Another great spot to visit is Wat Pho Ploy – a beautiful temple, located near the Chiang Dao Cave. There are 500 steps leading to it, but don’t be discouraged. 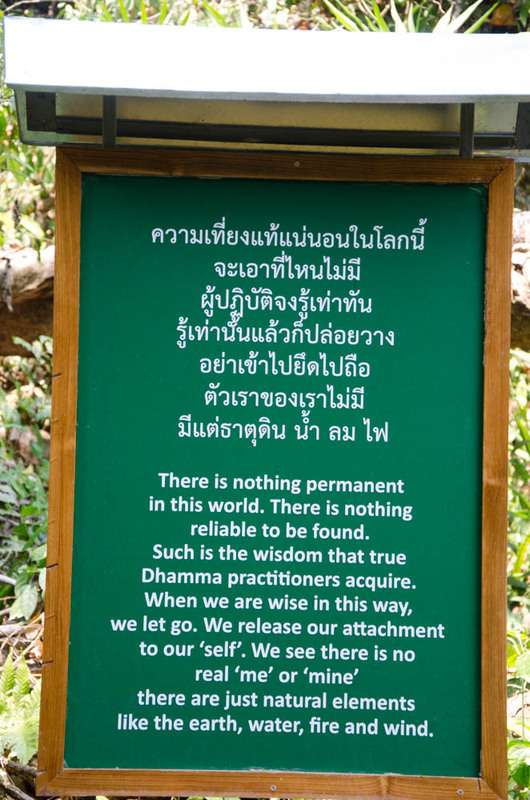 The way couldn’t be more scenic and you can stop from time to time to read the Buddhist quotes, spread out on the green boards on trees and rocks. 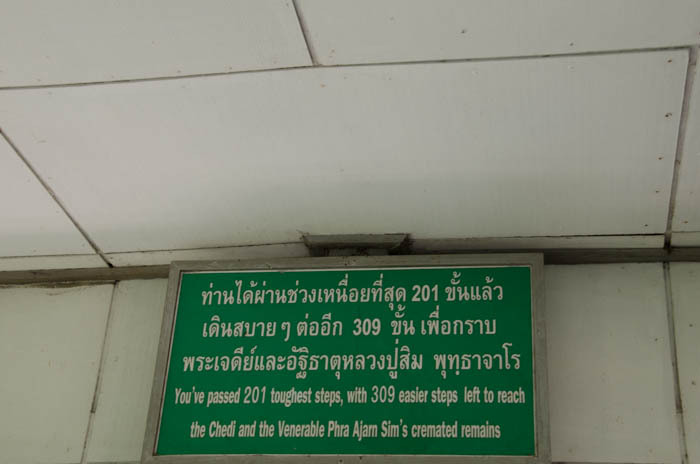 Only over 300 steps left! Once you get to the top you can sit on one of the benches and soak in the peaceful atmosphere. Walk few more steps up and you will have a few over the nearby forests. 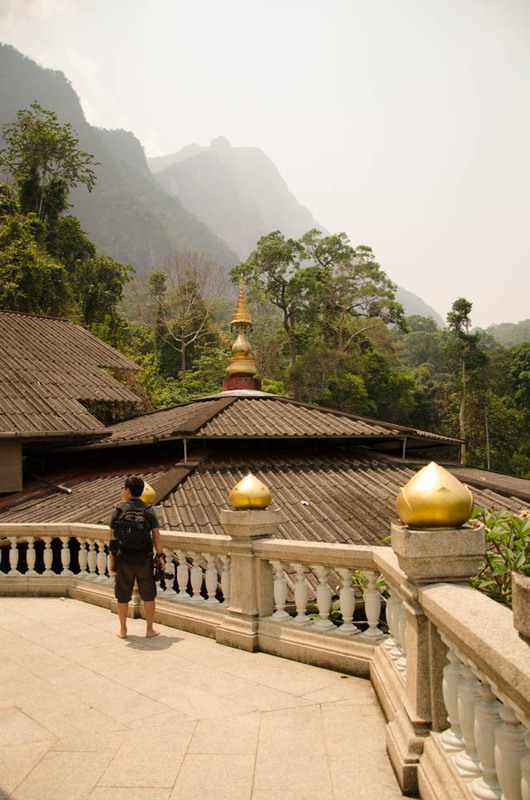 The temple is also a meditation retreat, so you can stay there for a bit and learn meditation from the monks. This is one of the ‘things to do’ on my list. There are not that many places to go during the evenings. ‘Bikers’ bar’, located on the main street, is a pub as well as restaurant, so if you fancy a beer in the evening, you can go there. Do not expect crowds and crazy party though! You can find cheap food easily, even at night. Mostly, it is Thai cuisine. This little town is 6 hours drive by mini van, or 9 hours by the a local bus, very close to the Burmese border. On my way there I took the latter for only 138 Baht. It was overcrowded and hot, but still pretty comfortable, with a lot of space for legs. 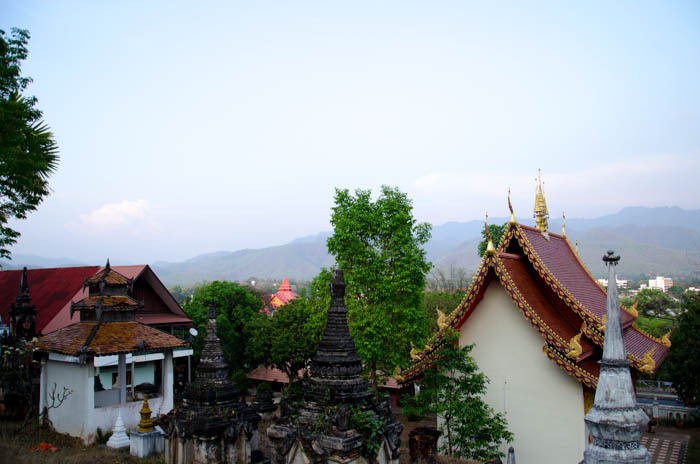 As with the Chiang Dao, you need to have your own mode of transport to see all the attractions around the town. If you are scared of driving a motorbike, you can still have a nice, quiet time in town. 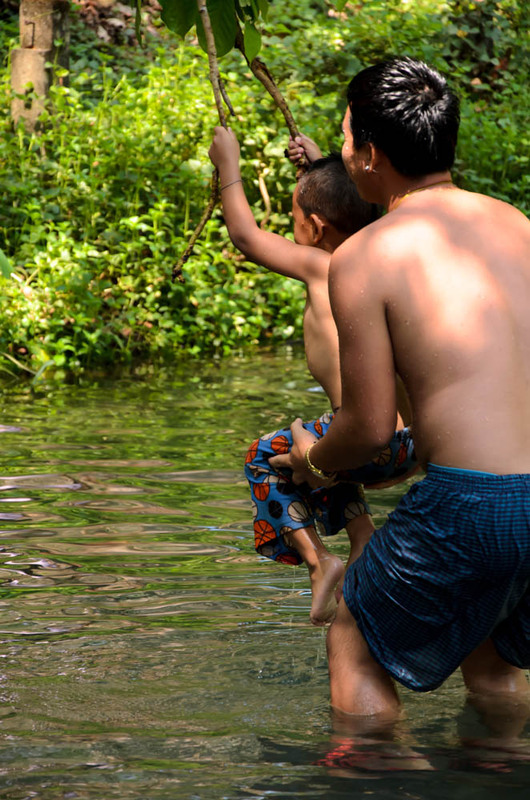 I visited Mae Hong Son during the low season, when it was so hot it was hard to breath. But yet, I found some good spots to chill out. First thing I noticed was the fact that the town was clean, picturesque and prepared for tourism. There are a lot of places to stay, the price ranging from 100 Baht to 700 Baht per night. I took a tuk tuk from the bus station (100 Baht) and asked the driver to take me to a cheap guesthouse. I stayed at Johnnie’s Place (150 Baht per night; fan room and shared bathroom) – place was nice, quiet, but could use some decent cleaning. However, it was located in the centre of the town, close to most of the attractions. 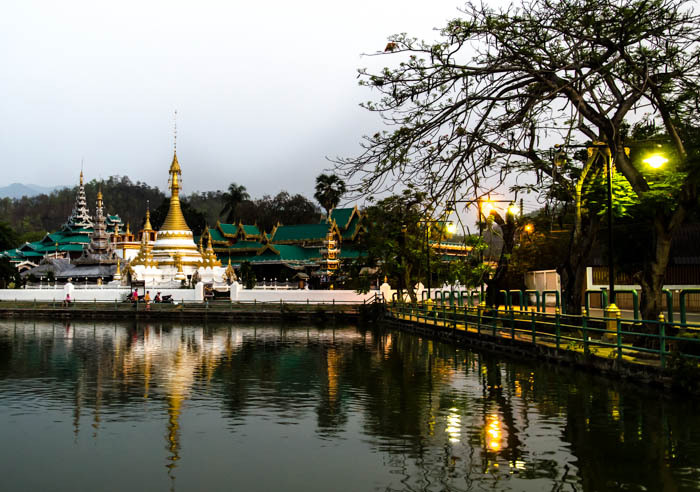 Mae Hong Son’s main spot is a round lake, with a nice walkways and places to sit down to admire the Wat Chong Kham, reflecting in the water. The temple features golden pillars, 4.85 meters Buddha and replica of the Buddha image in Wat Suthat in Bangkok. 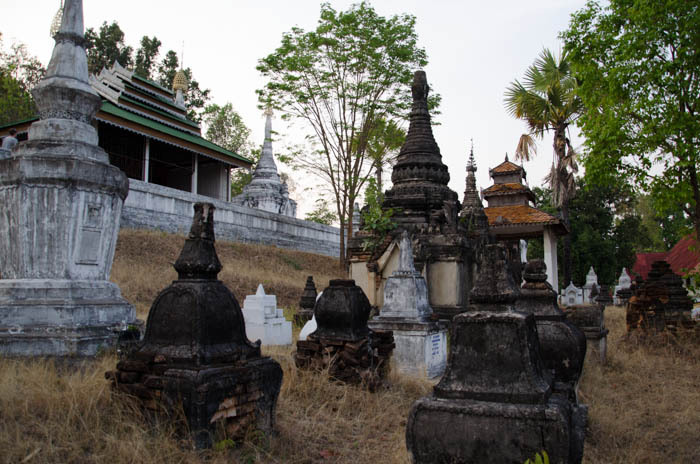 Wat Chong Klang, next to Wat Chong Kham, has a replica of the Phra Phutta Sihing and wooden figurines of human and animals created by Burmese craftsmen. Wat Phra Doi Kong Mu is a temple on the hill, which is great to watch sunrise. I must say, I was too lazy to get up in the morning, so there are no pictures from that site. Wat Muay Tor is an old temple, located outside of the city centre. Climb the stairs and visit the local graveyard. 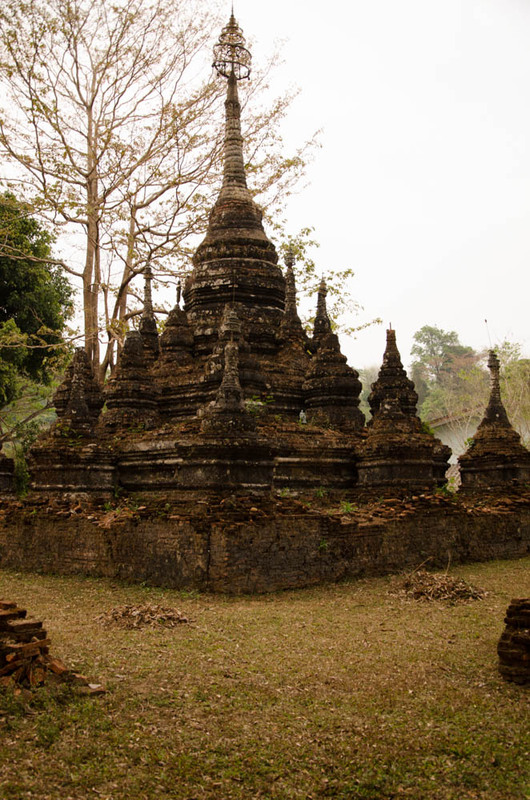 Wander around and admire the architecture of the Wat. If you are lucky, you might strike a conversation with the monks. When I was there, they were all sitting around in their quarters, enjoying cigarettes (yes! cigarettes!). 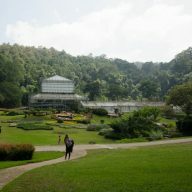 For a half a day trip, drive to Tham Pla Forest Park (17 km from the town). It is a beautiful, well kept park with a small cave, where you can admire huge fish, swimming in the nearby pond. They are considered as sacred and it is believed that feeding them (you can buy food for 20 Baht from one of the sellers at the entrance gates) will bring you good karma. 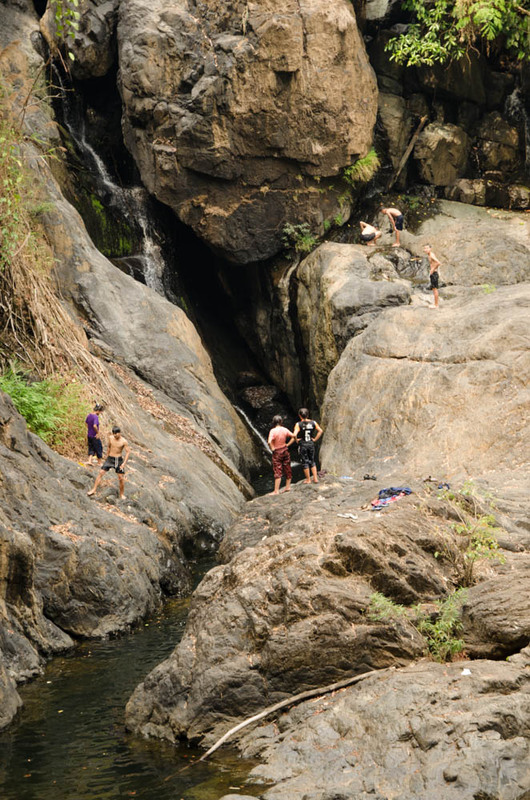 When I was there, the day was scorching hot, so I followed some local kids and jumped into the stream, leading to the cave. It was a very nice spot to relax and watch the locals having picnics. There are a couple of waterfalls around the area. I visited Namtok Pha Suea, 26 km from Mae Hong Son, on the route to Pai. It is a large waterfall with its water source in Myanmar. The water was pretty low when I was there due to the very dry weather, but I climbed to the top and had a splash in a tiny pond. The place was almost deserted, except a few local kids playing there. 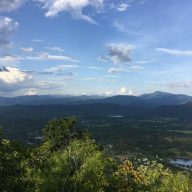 If you are tired with the heat, I would suggest going to Pha Suea for a whole day, climbing to the top of it and hiding in a shade there. 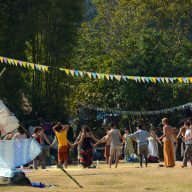 If you need a place to chill out, head to the big bride on River Pai, on the way to the Long Neck Village. 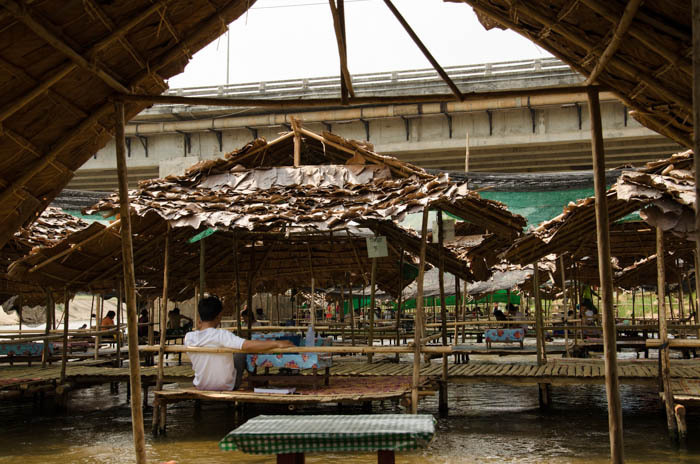 There are bamboo huts on the water, where for 60 Baht you can lay down, read your book and watch the kids playing. 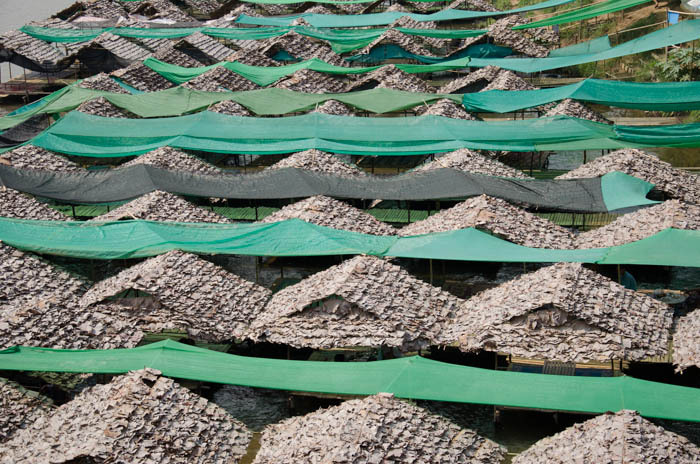 Mae Hong Son has a lot of places to eat and drink. You have a great choice between the local and western cuisine. The food is reasonably priced and everything is really delicious. Again, you can go for a quiet drink, but don’t expect any wild parties. The town goes to sleep at around midnight. 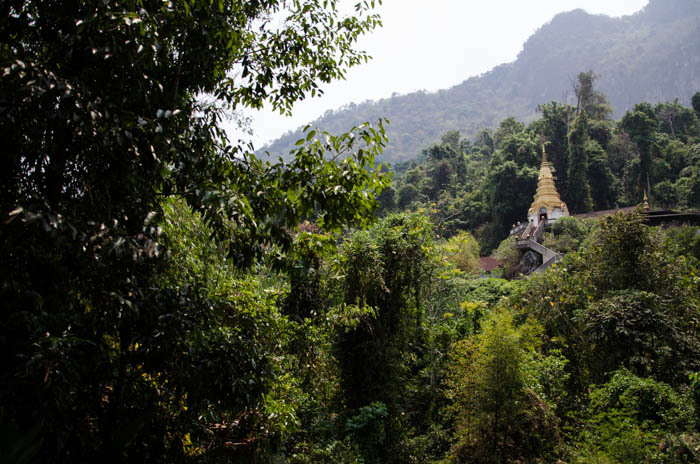 Both Chiang Dao and Mae Hong Son are easily accessible from Chiang Mai. They are both pretty, quiet and lovely towns with lots of things to do. So, if you are looking for something a little bit less frequented by travellers, something a little less touristy – those places are for you!